A conscientious shopper always reads labels when shopping for groceries. But if you are in the United States, those labels won’t tell you if there are genetically modified ingredients inside. Instead, you have to be a bit of a food detective, digging for the information yourself because the government and food producers alike don’t think you have a right to know. So how can one health-conscious consumer find out if their food contains GMOs? 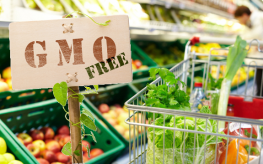 Below you will see 5 tips on how to avoid GMO foods in the grocery store. There are some definitive truths within our food industry that can help you determine which foods have GMOs and which do not. There are also many myths circulating about the presence of genetically modified organisms and ingredients. 1. Assume all non-organic corn, soy, cottonseed, and canola ingredients are GMO – In the U.S., these plants are likely all grown using genetically modified seeds. Basically, if it’s a food in the center aisles of your supermarket—where all of the processed garbage is—then it likely contains one or more of these ingredients. If you need something made with corn or soy, be sure to seek out certified organic products, which according to the certification process, cannot contain GMOs. This is an important tip on how to avoid GMO foods. 2. Stay away from artificial sweeteners – Aspartame is made using GM bacterial strains of E. coli. In addition, aspartame carries a whole host of negative side effects worth steering clear of. 3. Beware of “Invisible GM Ingredients” – Ingredients lists are often difficult to decipher, and some of these foreign-sounding ingredients are derived from genetically modified organisms (GMOs). Some of the more common products include: whey, xanthan gum, glutamate, hydrolyzed vegetable protein, lactic acid, cellulose, citric acid, maltodextrin, and mono and diglycerides. 4. Choose certified organic dairy products – Conventional dairy products are taken from cattle raised with rBGH, a growth hormone likely containing genetically modified components. Fortunately, there are organic and rBGH-free dairy products out there; they are also becoming more prevalent. 5. Don’t trust the produce stickers and PLU codes on fruits and vegetables – There are many myths regarding the small coded stickers on produce—that these codes can help identify GMO fruits and vegetables. But, while many people are convinced a 5-digit code beginning with an 8 identifies a GMO, such identification is completely optional and, as of yet, no produce providers have chosen to be so forthcoming. The one you can trust is a 5-digit code starting with a 9—that identifies organic fruits and vegetables and by their classification as certified organic, they are non-GMO. For some specific foods, check out our short GMO foods list. Avoiding genetically modified ingredients in the U.S. takes someone seriously dedicated to keeping themselves and their family as healthy as possible; it also takes a bit of work, though will become easier. Remember to revisit NaturalSociety for more tips on how to avoid GMO foods. IT’S SIMPLE… go back to the BASICS! Plant your own organic garden using composted materials (NOT using ‘miracle grow chemicals’ or ‘quick grow me fast and bigger’ modified anything and No weed killers! Then with the abundance of natural foods…CAN or freeze what you need for the rest of the year. Save your seeds, too. You want your family and the next generation (?) to live and be healthy…WORK HARDER… Not for money, but by the sweat of your own two hands providing for your family healthy food. It can be done. My grandparents did it… why can’t we… or have we become so soft and expect everything done for us! Some of the more common products include: whey, xanthan gum, glutamate, hydrolyzed vegetable protein, lactic acid, cellulose, citric acid, maltodextrin, and mono and diglycerides…. Arsenic is natural as are all forms of noxious molds. I am very conservative but modern health science even with a few failures here and there has kept us healthier and happier. This is not to say that we should not maintain a healthy skepticism and a “show me” attitude. Just living is a risk in itself. That being said I have no problems labeling GMO products and reading the product information as I devour my raisin brand in the morning. My serious risks in life are elsewhere. If you want to avoid GMO please do so but allow others to have access. wowow some people really need to research research research.. GMO FOODS ARE HORRIBLE FOR YOUR HEALTH AS WELL AS THE WORLD, and ill tell you why. someone earlier posted how we cant feed the world on old world agriculture.. !??!?!??!?!??! are you serious? i guess the ancients were eating GMOs too then. I digress, the problems with gmos is that by creating foods that are pollution resistant, bug repellant, yield heavy, etc etc etc etc!! what happens is you get a blend of so many other MONSANTO chemicals within fake foods that they are causing INFERTILITY ineffect causing human extinction in the long run. Stay with me here.. these chemicals must be produced in many huge industrial parks that not only pollute themselves in all ways possible, but destroy chances for OLD WORLD AGRi to even exist in such an environment. IN EFFECt making you believe you need GMOS! this is THEIR goal, please PLEASE dont fall under the spell. Not only that but GMO plants can mate with organic plants through wind and other methods causing the extinction of an original organic strand of lets say tomatoes. And although the US have true organic seed banks.. if you live in jubazipintan(made up) your F#%@#^D. There is a vicious cycle people and it has been planned way before GMOS hit the market. WE DONT NEED CHEMICALS, WE DONE NEED MONSANTO, WE DONT NEED GMOS! stop being brainwashed and wake uP! I hope this may help someone. Why don’t you make an article about how regular folks who don’t have a lot of money can afford these things? I’m sure we’d all like to buy them but most of us live on a budget and feeding 3 kids from the health food store isn’t an option. you guys need to join us in the real world. You either spend the money at the market, or spend it at the hospital. Sounds harsh but it’s true. You have to be selective. Even Sam’s wholesale has some organics. Wash/soaking every vegetable in baking soda water is helpful too. There are effective and cheap ways to grow organically (urban agriculture, urban farms, more local farms and home gardening). The public needs to be educated and local governments need to invest and provide economic incentives. My beef (apologies to vegans) with GMO fruits and vegetables is that they are tasteless and the seeds are sterile – I am on a crusade against tasteless tomatoes (with fly DNA!). My advice is to either get certified organic seeds and grow them yourself, or save the seeds from organic (or heirloom) produce. If no seeds germinate, it is a sure sign that you have been ripped off. A recent article I read said the author had searched widely and could not find a single instance where a human was caused harm by GMO foods in a scientifically documented way. Anyone in their right mind knows we are not going to feed the world with organic food. There is insufficient organic fertilizer available to do this. The 3rd world has been trying old style ag for many yrs and routinely starves One needs to look at the pro’s and con’s. Pro- we use less herbicide/pesticides which also might be bad for you, better yields, less soil runoff through no till farming, etc. Con’s- high seed prices, hype that it is killing us all even though lifespan continues to climb. “Several animal studies indicate serious health risks associated with GM food, including infertility, immune problems, accelerated aging, insulin regulation, and changes in major organs and the gastrointestinal system. Renowned biologist Pushpa M. Bhargava also believes that GMOs are a major contributor to the deteriorating health in America. Keep drinking the Kool-Aid…Organic Farming rotation far surpasses GMO without the need for nazi chemicals & without the supper weeds!…You are egregiously misinformed, unless you just strictly get your information from TV & Big AG financed propaganda…or you’re a paid pathetic troll. Yet another instance where you add nothing, and accuse someone with facts of being a troll. How sad. Look up Echo Global Farms and you will find that they are helping people all over the world with raising crops – with much success. Their thoughts are similar to “Teach a man to fish and he will eat for a lifetime”…. I’m trying to figure out why the author is so frightened of GMO foods. Nature has been “genetically modifying” every organism on earth for billions of years. It hardly seems plausible to me that some horrible monster will be created by GMO today. But hey, if you want to avoid GMO like the plague, be my guest! And humans have been adapting to the changing organisms for millions of years. Changing the structure of organisms over an infinitesimal (by comparison) time period can (possibly) be devastating to humans. We are a science experiment. As I understand, humans have not even adapted to grains yet (which have been around for a while). I believe earlier generations used fermentation to make them more easily digested. Very likely increased GMO use will result in declining health. Again, we are a science experiment. You said it yourself, “billions of years.” You can’t simply modify something, stick it in your body, and expect everything to be okey dokey. By horrible monster do you mean MSG? How about HFCS that’s made from GMO corn? Not to be imprudent, but when was the last time you took a chemistry class? Like Still caveman says, humans haven’t even evolved to the point where we can properly digest and use grains efficiently. Why is there an ad with a USDA-affiliated farmer ad opposing gmo labeling here???? Isn’t that contrary to have that here with this article? What’s really being featured here? The labeling campaign is not at all confusing or expensive as opponents (i.e., the Monsanto-run usda, dow, Syngenta chemical companies) want people to believe. I-522 wants already-existing ingredients lists to identify what ingredients are genetically engineered, such as “genetically-engineered corn syrup” instead of just “corn syrup”. It doesn’t include anything further at this time, just the products that have ingredients listed on their labels. These mega-corporates are spending millions on misleading ads and slick flyers to keep us in the dark. All the more reason to label gmos. What do they have to hide by insisting anonymity? Wow I did not know that..